"Walk Barefoot" is similar in technique to "Lucia's Garden". 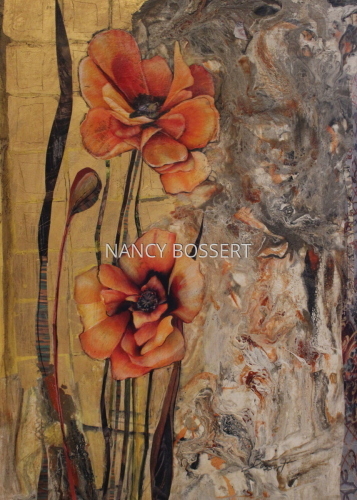 This is a vertical , mixed media painting on a deep stretched canvas measuring 30" x 15" x 1.5" . To me, keeping this low keyed and textural gives me the feeling of walking in a garden with my eyes closed and soaking in the feel of lush textures. So cloration needs to be muted and thoughtful. You can touch. Let your fingers feel the raised textures of the flora and its movement. The color is best described as a putty washed brick with many subtle undertones. View my details of this piece, allow it to usher you into the garden. Check out the framing under the print selection on artspan. Artspan does such a wonderful job of allowing you to see how this and many other fine art pieces look in a variety of frames. It costs nothing to play and learn with this fantastic option. 10" x 5"14" x 7"18" x 9"22" x 11"26" x 13"27" x 13.5"
Open the windows and let Spring enter. Lucia's Garden is more tonal, but it is a nob to the blossoms that will be coming soon. It is a statement the branches are getting ready to erupt in the full color splendor. Right now the colors are laying low, but the flowers are palpable. That is why my visual story is low keyed and allowing the flowers to remain as textural beings and not full color. Allow your imagination to expand, from what you know the season will bring. The blossoms we will enjoy are only under a temporary veil. The canvas measures, 48" x 24" x 1.5" . This is wired for immediate hanging. This painting can be framed, but framing is not necessary. Coloration of negative space is more of a putty hue with the floral areas being a dulled red or medium to lighter brick hue. There are a few punctuation of a steely looking teal. Enjoy the wealth of texture. And definitely touch! 14.25" x 7"15" x 7.5"18.25" x 9"22.25" x 11"26.25" x 13"27.75" x 13.75"
I have always loved to render a few flowers. That rendering occurs between other images; I will rock back to explore a flower I enjoy. This happens to be the lotus, inspired by my pond. 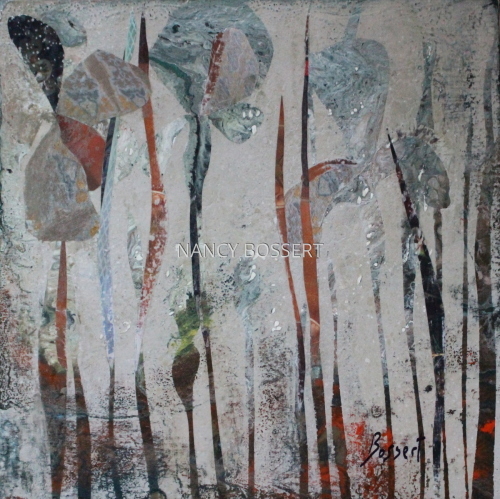 This is similar to "Dark Lotus" which has been sold and was a vertical piece. This, however is a square format, and the technique requires numerous levels of work for the end result. I wanted to keep it dark, but the piece can really change when exposed to a room with more lighting. The color base, other than it is a heavily collage surface, is deep tonal blue and rust. This still allows some of the collage elements to take on their own coloration. I then use layers of medium and then mask my flower and stem areas. I wanted this to remain low key, the value change between the flower elements and the negative space, so once I mask off, it is hard to exact the hue that is underneath. I use the same coloration of paints with more medium and glaze, hoping to create the subtle variation between positive and negative areas. I was very pleased to see the result when masking was removed. Then an additional layer of proper acrylic varnish was necessary to finish. I believe I will still frame if not purchased prior. Enjoy, watch your wonderful flowers at night. They dance and sparkle. 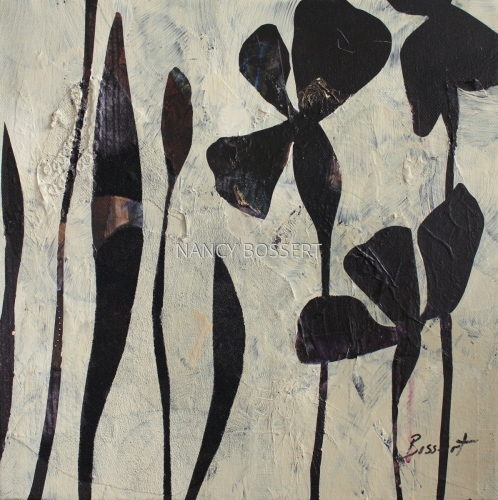 "Midnight Lotus" measures 20" x 20" x 1 1/2". 10" x 10"12" x 12"14" x 14"16" x 16"17" x 17.25"19.25" x 19.25"
"Merlot Iris" is subject matter that I have traveled before, but with my area just feeling a touch of Spring warmth,I am pulled even more into the Good Vibes of blooms. These pieces combine a number of techniques, the process is always exhilarating. I want to run around and light fragrant candles, open windows,and put on island music to get all the senses in gear. And I can dance! Coloration, negative space is beige mix, flowers are merlot/burgundy and greens. Very tonal. 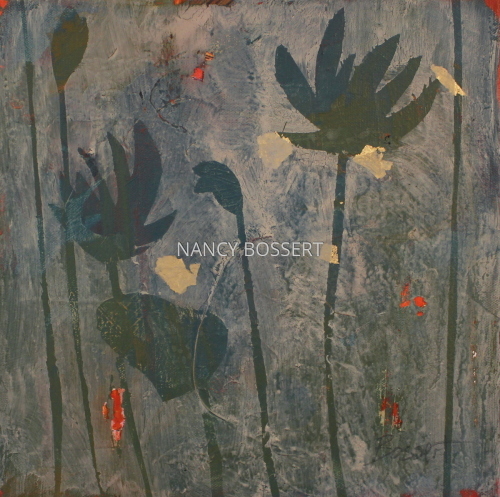 "Merlot Iris" measures 10" square format, wood canvas, that is 3/4" deep. This painting is framed in a black wood floater frame, outer dimensions with frame are 11 1/2" x 11 1/2" x 1 1/2" deep. Even if you only want to purchase the original, check out the print options on Artspan. Artspan allows you the opportunity to PLAY with the art and see how it looks framed many different ways and you can even change the wall color. So experiment and have fun. 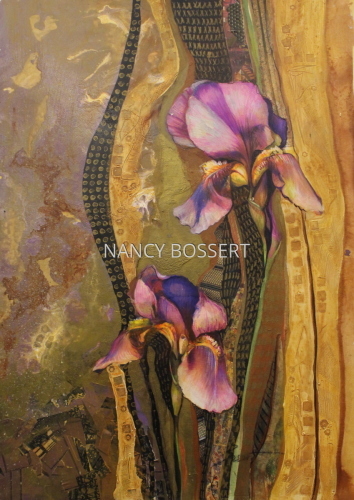 "Dancing Iris" is subject matter that I have traveled before, but with my area just feeling a touch of Spring warmth,I am pulled even more into the Good Vibes of blooms. "Dancing Iris" measures 12" square format, wood canvas, that is 7/8" deep. This does not need a frame, but I would probably place this into a floater frame for display. Working in art just feels so good.... Whether I am working with the human figure, the beautiful poppy, or exploring the fabulous space of abstractions.... all make me what I am and how my hands work. 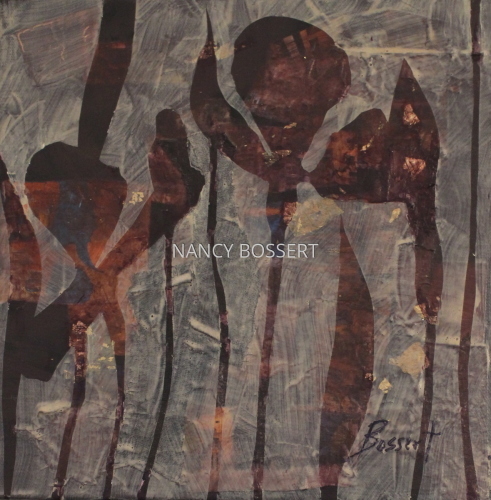 Check out my blog, nancybossert.blogspot.com ,( or hit my blog link on artspan), where I try to break down the mechanical process and the emotional process of a few of my paintings. For me it doesn't seem far fetched that I will find the urge to create some jewelry pieces for galleries and on line. 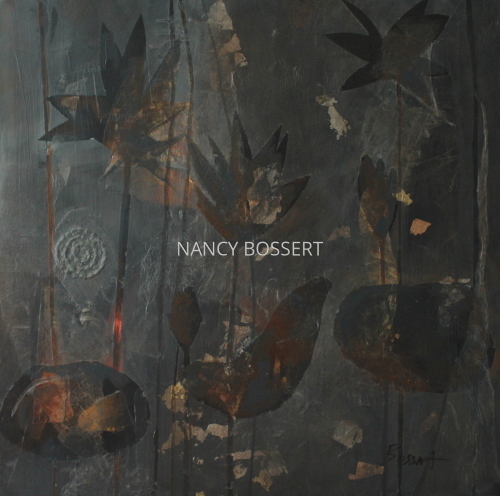 Touching the textures and seeing the colors, shapes and forms will have a direct relationship to my paintings. "Poppy Pour" is still pushing my interest in the pour/swipe technique of painting, but pushing it to a different place. I did this with a few of the recent flower pieces and with "Dreams". I just traveled and was able to visit a favorite model. We had some great time spent, but the images I have of her are different than normal for me. So I am anxious to see where I go with these. Again, with "Poppy pour" this piece involves numerous steps to get to my end result. I do teach on line privately and teach in my studio also. Inquiries are always welcome. This piece needs to be under glass. The paper measures 30" x 22 1/2". The paper I always use is archival, 100% cotton rag and acid free. The area I would expose through the opening in a frame or mat would be approximately 27 1/2" x 19" . 7" x 5"11.25" x 8"15.5" x 11"19.5" x 14"23.75" x 17"27.25" x 19.5"
"Tapestry Poppies", is a acrylic/mixed media painting on a 24" x 24" x 1.5" stretched canvas. These started as my interested in a dirty pour/swipe technique, but wanting to take it further. I have down a number of these, but added more manipulation of the paints to create my effects. I started a blog, and unfortunately, I messed that up today and hope to get that back up and running. I explained this piece from start to finish. I began with a dirty pour/swipe, in three sections, the third section was after the first two dried. I then planned the mass and linear painting using two of the coloration used prior (bronze and orange. Decided to go with poppy flower which is a favorite of mine and a tapestry look. I used collage to create the poppies and gold linear work. Followed up with three layers of glaze sanding in between each. This is a lot of color for me, but it has some magic in the patterns and how they compliment. This is such a Wow on the wall, mix your collection to add that eclectic excitement! I am so.. pleased with this piece and anxious to do more. I plan to do a figurative piece shortly using this method. 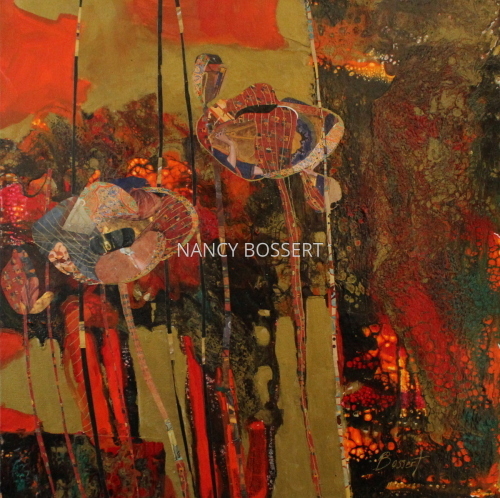 Sacred red II, is an acrylic/ mixed media painting on a 12" x 12" stretched canvas. I have explained this process on my blog, nancybossert.blogspot.com. My Blog has a direct link from my artspan site. This is handled in the same manor as "Granite Narcissus" and "Tapestry Poppies" and I have a new figurative in progress using the same technique. 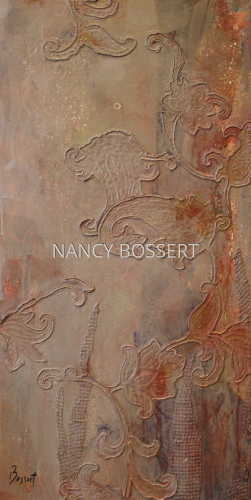 Follow me on Instagram: bossertnancy and you can see many additional pieces not always making it to my on-line sites. I always welcome questions and comments. On this one I utilized the pour/swipe technique with acrylic and then worked back into the piece. And, yes, I did include the face of Christ in the poppy. Christian iconography of the poppy: A poppy may represent sleep or indifference because of its narcotic qualities. It is sometimes used in depictions of the Passion of Christ as a reference to the sleep of death. 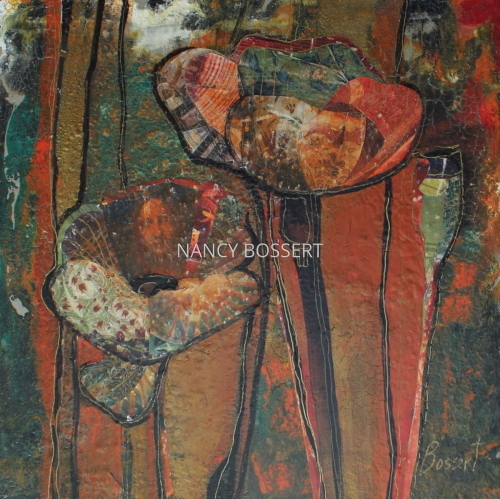 I added numerous collage pieces with a variety of patterns and visual textures in a specific color theme. I wanted the poppies to become one with the acrylic pour/swipe and then my inclusion of additional painted areas. I added gold linear work in creating more patterns and in edging. The final varnish is a satin. I enjoy the satin look and feel to the completed piece. This is framed in a fantastic gold crackle wood floater frame and is wired for immediate hanging. 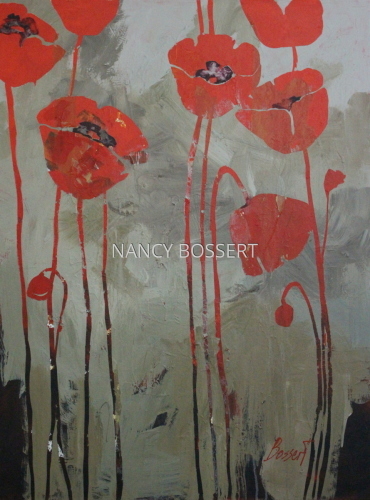 "Tall Poppies", is a acrylic/mixed media painting on a 12" x 24" x .75" stretched canvas. These started with my interested in a dirty pour/swipe technique, but wanting to take it further. I have done a number of these, but added more manipulation of the paints to create my effects. My Blog, linked to Artspan, explains the technical and some of the emotional aspects of my work. 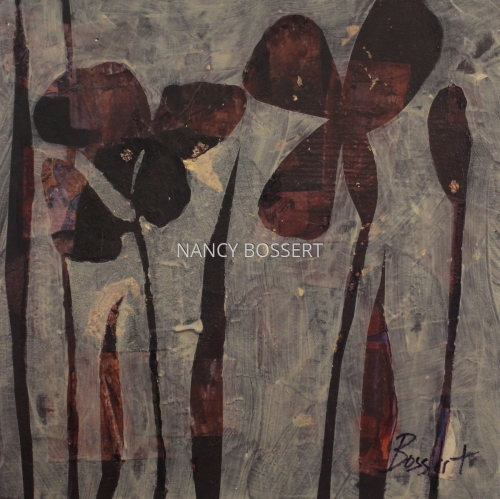 nancybossert.blogspot.com. Decided to go with poppy flower which is a favorite of mine and a tapestry look. I used collage to create the poppies and gold linear work. Followed up with three layers of satin glaze sanding in between each. This is a lot of color for me, but it has some majolica in the patterns and how they compliment. Check this piece out with the print option, so much fun to play with and see how different frames can look on a piece. A plus with this size canvas is it can be easily framed, no glass. Where the deeper canvases look fine unframed or in floater frames. 14.25" x 7"15" x 7.5"18.25" x 9"22.25" x 11"26.5" x 13"29.25" x 14.5"
"Duo Koi" is a new piece that was created upon the return of seeing my Mother. ( Also created at the same time was Pears on Gold. Inspired by her and many of my older pieces, I felt the pull to work an older technique of mine. Needless to say my days spent with her were wonderful. This painting begins as the paper is primed for the gold leaf and then I added a watercolor and acrylic mix to create my orange, which borders varying amounts of the gold leaf section. 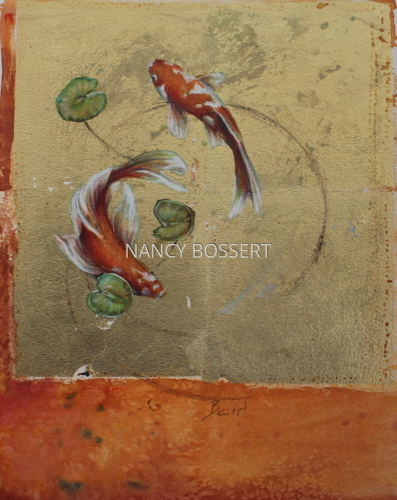 The Koi and water lily pads are then rendered on top of the gold leaf with the same mix of paints and pencil. This piece does require glass. Enjoy all the possibilities in matting and framing.
" Iris Gentle Sway" is an acrylic painting on a triple primed canvas. I prepared this surface in numerous levels. First doing my triple prime in a deeper value. The canvas measures 12" x 12" x 1 1/2". I added numerous archival papers, leafing and textiles to the surface and then added more pigment to create my deep purple hue. This required 3 layers and sanding. I then masked off my area for my blossoms and stems and added a medium to secure the edges. The negative space coloration is over the deep purple and reveals the Iris and interest. This color can best be characterized as a translucent cream wash, where strokes are evident. The sides of the painting retain the deep black/purple. The Iris blossoms float in the space with an abundance of subtle texture a color waves. This is a great pairing to "Iris Light". Frame is included, overall size framed in a floater frame, 14 1/4" x 14 1/4" Lots of tactile texture.
" Iris Light" is an acrylic painting on a triple primed canvas. I prepared this surface in numerous levels. First doing my triple prime in a deeper value. The canvas measures 12" x 12" x 1 1/2". I added numerous archival papers, leafing and textiles to the surface and then added more pigment to create my deep purple hue. This required 3 layers and sanding. I then masked off my area for my blossoms and stems and added a medium to secure the edges. The negative space coloration is over the deep purple and reveals the Iris and interest. This color can best be characterized as a translucent cream wash, where strokes are evident. The sides of the painting retain the deep black/purple. The Iris blossoms float in the space with an abundance of subtle texture a color waves. This is a great pairing to "Iris Gentle Sway". Frame is included, overall size framed in a floater frame, 14 1/4" x 14 1/4" Lots of tactile texture.
" Iris Wake" is an acrylic painting on a triple primed canvas. I prepared this surface in numerous levels. First doing my triple prime in a deeper value. The canvas measures 12" x 12" x 1 1/2". I added numerous archival papers, leafing and textiles to the surface and then added more pigment to create my deep black /purple hue. This required 3 layers and sanding. I then masked off my area for my blossoms and stems and added a medium to secure the edges. The negative space coloration is over the deep purple and reveals the Iris and interest. This color can best be characterized as cream and variations of cream. The sides of the painting retain the deep black/purple. This is a great pairing to "Iris Bloom". Frame is included, overall size framed in a floater frame, 14 1/4" x 14 1/4" Lots of tactile texture.
" 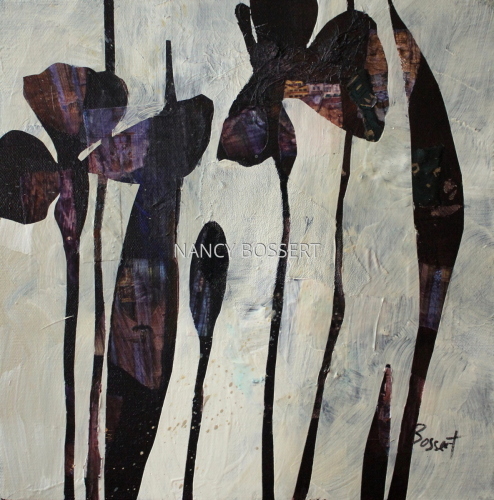 Iris Bloom" is an acrylic painting on a triple primed canvas. I prepared this surface in numerous levels. First doing my triple prime in a deeper value. The canvas measures 12" x 12" x 1 1/2". I added numerous archival papers, leafing and textiles to the surface and then added more pigment to create my deep black /purple hue. This required 3 layers and sanding. I then masked off my area for my blossoms and stems and added a medium to secure the edges. The negative space coloration is over the deep purple and reveals the Iris and interest. This color can best be characterized as cream and variations of cream. The sides of the painting retain the deep black/purple. Frame is included, overall size framed in a floater frame, 14 1/4" x 14 1/4" Lots of tactile texture. "Blue Koi" is an acrylic painting with a collage base. My love for texture and muted hues truly reveals itself in this painting. Very narrow, this painting measures 16" wide and 40" in height. The approach to this painting is similar to "Dark Lotus" and "Blue Stone Magnolia". I began with a triple primed stretched canvas surface, with a darker acrylic wash. I then added archival papers and prepared textiles to the surface and coated with additional layers of acrylic paint in deep blue hues. I later masked off the areas I wanted to remain the deep blue and sealed those area. Next painting layers of acrylic paint in oyster off white, yellow ocher, rust and glazes. the excitement happens in removing the mask to reveal the fish and plant life. Lots of underlying coloration and tactile texture. This painting has a gloss finish, and could accept a frame, however the canvas is wider, 1 7/8" sides are painted a deep blue black color. There is some gold leafing in this piece. Blue Koi and Dark Lotus are those wonderful pieces that when you bring them home you will find so many locations to place them in your home or collection. The size makes them so versatile on that slim/column wall or smaller wall you want to bring attention to. The sphere raised shapes in "Blue Koi" add dimension as well as the feeling of water space and interest. Love the process, love the result. 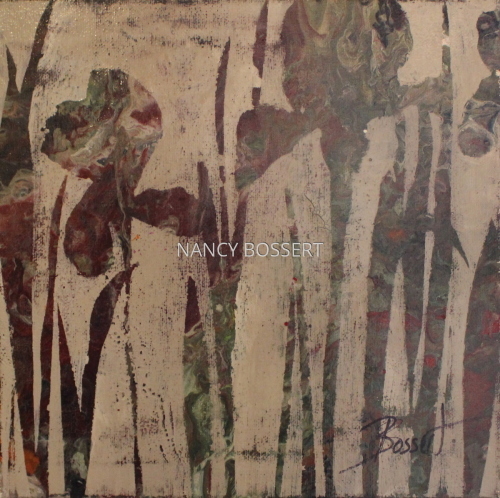 12.75" x 5"17.75" x 7"22.75" x 9"27.75" x 11"32.75" x 13"33.75" x 13.5"
"Slender Iris" is an acrylic painting on a triple primed canvas. I prepared this surface in numerous levels. First doing my triple prime in a deeper value. The canvas measures 24" x 12" x 1 1/2". I added numerous archival papers, leafing and textiles to the surface and then added more pigment to create my deep black /purple hue. This required 3 layers and sanding. I then masked off my area for my blossoms and stems and added a medium to secure the edges. The negative space coloration is over the deep purple and reveals the Iris and interest. This color can best be characterized as cream and variations of cream. The sides of the painting retain the deep black/purple. No frame is necessary so enjoy with or without a frame. "Dark Lotus" is an acrylic painting with a collage base. My love for texture and muted hues truly reveals itself in this painting. Very narrow, this painting measures 16" wide and 40" in height. And will add drama to any location. The coloration really changes with the lighting in the room, the painting seems to be a bit of the chameleon, but basically it is darker hues of brown and a grayed brown, with many other subtle colors breaking through or underlying the brown surface and nudging their way to be seen. This painting has a semi gloss finish, and could accept a frame, however the canvas is a wider frame and the painting carries over onto the 1 7/8" sides.
" 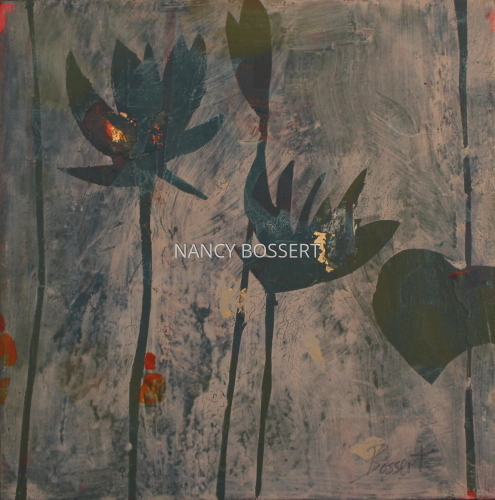 Palm Lotus" is an acrylic painting on a triple primed canvas. I prepared this surface in numerous levels. First doing my triple prime in a deeper value. The canvas measures 12" x 12" x 1 1/2". I added numerous archival papers, leafing and textiles to the surface and then added more pigment to create my teal varied surface. This required 3 layers and sanding. I then masked off my area for my blossoms and stems and added a medium to secure the edges. The negative space coloration is over the teal hues and reveals the lotus and interest. This color can best be characterized as transparent/translucent cream and variations of cream. The sides of the painting retain a teal and red coloring. Touches of red, red/orange pop through the surface plane. Frame is included, overall size framed in a floater frame, 14 1/4" x 14 1/4"
" Palm Lotus 2" is an acrylic painting on a triple primed canvas. I never procrastinate on a piece, but I must have on this one. It sat in the studio incomplete for months. A curator saw it and asked for it for a botanical exhibition, and I shrugged it off. Just not wanting to put a couple hours into the completion, too tight, or just wanting to do other things. I generally finish all pieces within a few days. This is a floral similar to Poppy Pour on archival paper measuring approximately 30" x 22". I have shown the full sheet of paper and I have used almost the full sheet. This is framed for the exhibition. This will be for Sale at the conclusion of the exhibition, unframed. The area I would expose through the opening in a mat or frame would be approximately 28" x 20". So many options for framing, so enjoy that process. This is a mixed media in which I start out with an acrylic pour with golden/bronze, rust, purple, and ocher. I map out my drawing of two iris blooms. One of my favorite paint materials to use is gesso, for a multitude of reasons. I used gesso and colored the area a golden yellow and stamped that area with a variety of tools and my favorite square small block. Love the texture that the stamping reveals. I added papers, some of which I went in with a gold pen and did repetitive designs. Then to the iris, using acrylic paints, marker and pencil. Always stepping back to view the overall composition. Enjoy, bring the garden inside.